WHO WAS THE FIRST INDIGENOUS SOUTH AFRICAN TO VISIT ENGLAND AND WHEN? This is a question which I have often posed to fellow South Africans. All inevitably cannot give me the answer. There are other questions which I ask, that always has peo…ple responding with the wrong answer: IN WHICH YEAR WAS THE BEGINNINGS OF A COLONY FIRST ESTABLISHED AT THE CAPE AND BY WHOM? People will immediately trot out the same old answer – 1652 by Jan van Riebeeck under the VOC (Dutch East India Company). Even a UCT History Professor got rattled and made an ignorant retort in the university’s Monday Paper, when I challenged the validity of this answer and responded that the first attempt was by a dozen British Convicts from Newgate Prison under Captains Crosse and Peyton, sponsored by Lord Smythe of the British East India Company in 1615, and that technically when the Dutch set up shop in 1652 it was in defiance of British annexation of the territory formalised in 1620. Likewise with the question: WHICH EXTERNAL POWER’S FLEET FIRST ROUNDED THE CAPE OF GOOD HOPE AND WHO WAS THE NAVIGATOR-IN-CHIEF? Again here people will reply that it was a Portuguese Fleet under Bartholomew Dias. Challenging historian and former British naval captain, Menzies in his groundrbreaking book- 1421 – gives the account of Admiral Zeng He of the Imperial Chinese fleet and his rounding of the Cape and circumnavigation of the world. I first read this work shortly after working with Dr Frene Ginwala when she set up an exhibition of a large silk replica map flown in from China showing Admiral Zeng He’s map of the world where the southern tip of Africa is accurately depicted as is the Drakensberg Mountain range – at a time when the Eutopeans had no such map. It is unfortunate that our academic institutions are still churning out old Eurocentric stories and old white colonial ‘historical’ information without question. There are so many exciting and challenging new views, materials and facts which would have an amazing and I believe positive influence on how we think as South Africans. So much is just not in the public arena and not subject to dialogue. South Africans suffer under a very singular mindset and a mechanical way of thinking largely due to the propagandistic education system to which they were subjected. Even when it comes to understanding the early roots of Apartheid, it is projected that Apartheid is a post-1948 phenomenon associated only with the (purified) National Party of DF Malan. This of course tends to exhonerate the previous United South African National Party (UP), South African Party and Progressive Union Party and Cape Colony predecessor parties from colonial and Apartheid practices. For some reason the writer of one of the comments posted on an earlier posting of mine, seems to think that ‘Swart Gevaar’ is a relatively modern phenomenon in South Africa. The writer displays a one dimensional approach to the subject at hand. This is the effect of years of education institutions presenting a rather warped version of local history. But I am now straying from the original question. Who was the first indigene from the Cape to visit England and when was this? The ANSWER is Chief Xhore (Coree) of the Goringhaiqua people and the year was 1613. Chief Xhore was returned to the Cape a year later in 1614 when the British East India Company had hoped that he would assist them with the stablishment in 1615 of a penal colony comprising of convicts from Newgate prison. Chief Xhore and another Goringhaiqua man were tricked into boarding the HMS Hector, plied with food and wine, and while asleep the ship set sail for England. They were kidnapped and along the way Chief Xhore’s companion died. He spent much of a year in England, very unhappy and continuously protesting that he wanted to go home. He had to wear European clothes and was paraded befor the royalty and nobility as a novelty. He was also put through a grueling regimen of english language tuition by Lord Smythe. Then in 1614 Chief Xhore had to undergo the difficult voyage back to the Cape of Good Hope to rejoin his people. But much to the annoyance of the British, once back home, Chief Xhore was far from compliant. He had also learnt much about British ways, and the value of their goods (particularly the shiny metals and trinkets they used for bartering as well as the value of cattle). Xhore also learnt about inter-European antagonisms and about the vulnerabilities of the whites and their less than ‘godlike’ status. He realised that far away from home, in Africa, the Khoena people had more power than the outsiders. Chief Xhore allowed the British ships to offload the settler convicts under Captain Peyton and Captain Crosse. He allowed them to leave provisions and a longboat for local travel and even assisted the settler party to set themselves up. But once the fleet set sail Chief Xhore quickly showed the British Newgate Settlers who was boss. 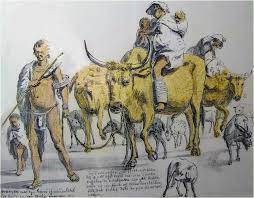 The convicts were an undisciplined and ruly lot and of course were also interested in the Khoena women, cattle and provisions. They were however absolutely helpless in this strange and inhospitable place with its harsh weather conditions. The clash between the Newgate Settlers and the Gorinhaiqua Khoena was inevitable and Xhore chased them off in their longboat. Some of the sttlers lost their lives while others made it to Robben Island where they set up home, awaiting a return fleet. When a returning fleet arrived in the Bay more of the settlers died trying to make their way to the ships on rafts, after the longboat had long since been wrecked. Only three of the original Newgate Setllers survived and returned to England. It is recorded that these again got into troubled and were hanged at Newgate Prison. Instead of South Africa becoming Britains Penal Colony – Australia was chosen for this, and the Cape was left to the Dutch East India Company until 1806. The British tried to introduce convicts to the Cape on a few occasions in the 1800s but their first unsuccessful attempt just faded from the pages of history. Chief Xhore was killed by the Dutch at the end of the third decade of the 17th century, but he had paved the way for another entrepreneurial Khoena rebel Autshumoa, who was the first indigene to be taken by the British to Batavia (Jakarta) and returned to the Cape. Chief Xhore is not noted in our history nor is his memory in our public spaces yet this remarkable man was a first amongst men. In his story about Chief Xhore, the avante guarde writer Jack Cope, entitled his story – ‘The King of the Hottentots’. In the 1940s, 50s and 60s men and women writers like Jack Cope, Uys Krige and Ingrid Jonker broke many boundaries under the difficult circumstances of neo-fascism, while today with all our freedoms people and our institutions of learning just lazily pump out yesterdays ideological nonsense without question. Our City of Cape Town does not honour Xhore at all. Likewise Autshumoa is recorded by official histories simply as an ignorant beachbum called Harry the Strandlooper, regardless of founding the first settled Khoena group from maroons of other clans, the Goringhaicona, and his establishing the foundation of the City of Cape Town in the form of the Camissa trading settlement on the banks of the Camissa river (over 25 years prior to the van Riebeeck party’s arrival). Van Riebeeck in 1652 relied heavily on the multi-linguistic skills and trading skills of Chief Autshumoa and his niece Kratoa, when he first lived cheek by jowel on the bank of the Camissa alongside Autshumoa while it took him 6 months to erect a Fort. Without Autshumoa and the Goringhaicona’s assistance van Riebeeck would have found it much more difficult to survive those harsh winter months. Autshumoa was a skillful and talented leader and trailblazer and not a mere vagabond beachbum. He had already some years previously first set up a refreshment station with 20 of his followers on Robben Island and he was notably enterprising. His memory is not celebrated in Cape Town today and neither is his Camissa settlement on which Cape Town Minstrels is founded. When you next walk down Strand Street and the Grand Parade….give a thought to Chief Xhore and Chief Autshumoa. Our children know more about the remarkably similar Pocohontas story and absolutely nothing about Xhore.